After we eat our fill on Thanksgiving and succumb to the sleep-inducing combination of carbohydrates, tryptophan and adult beverages, millions of us will get up the next morning to take advantage of great deals offered on the first official day of the holiday shopping season. While this tradition dates back to the early 20th century, traditions inevitably change with the times. More shoppers are making purchases on Thanksgiving day, and more are choosing to avoid the Black Friday crowds by shopping at home. The volume of Cyber Monday shopping has also picked up in recent years. So what can we expect for this year’s holiday shopping season? Read on to find out. While Thanksgiving was long excluded from the shopping frenzy, sales have picked up in recent years due to the prevalence of internet shopping, and increasing numbers of retailers choosing to open their doors on Thanksgiving Day evening. Online sales for Thanksgiving 2012 totaled $633 million, a 32% increase over Turkey Day 2011. 35 million people visited a retail store on Thanksgiving 2012, an increase of 6 million over the previous year. Even though Black Friday is just one day, most retailers talk about Black Friday sales in terms of the four-day stretch from Thursday through Sunday. Market research shows that last year 247 million people participated in this four-day shopping event, spending $59 billion, up from $52.4 billion in 2011. While the commonly accepted origin of the name Black Friday stems from the idea that this is the day that many retailers finally make it into the black for the year, this story was actually created by the retail industry in the 1980’s. The name was actually created by the Philadelphia Police Department in the 1960’s, which bestowed this name on the day because of the massive traffic jams and over-crowded sidewalks it created. This isn’t the only time retailers changed Black Friday’s history. In the 1940’s, the industry successfully lobbied for Thanksgiving to be moved from the last Thursday in November to the second to last in order to move up Black Friday and extend the shopping season. After two years and lots of controversy, a compromise was reached, making Thanksgiving the fourth Thursday in November. The traditional lore goes that online sales saw a significant increase on the Monday after Black Friday, and thus the name Cyber Monday was born. Actually, Cyber Monday was the brainchild of Shop.org executives, who came up with the idea as a marketing campaign at a time when online sales for this day were actually not as strong as they were in mid-December. The combination of a catchy name and ever-increasing access to the internet through both home and mobile devices turned Cyber Monday into a powerhouse, and it has become one of the biggest online shopping days of the holiday season. Cyber Monday sales were over $1.6 billion in 2012, a 30.3% increase over 2011. 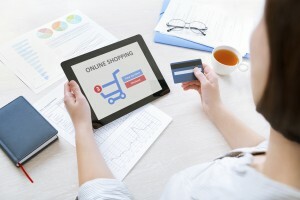 In recent years, the industry has made an effort to pitch “Cyber Black Friday”, which encourages consumers to stay home and do their shopping online on Black Friday. Though it has gained some traction, Cyber Monday’s online sales in 2012 were still more than 36% higher than those on Black Friday. This entry was posted on Wednesday, November 27th, 2013 at 7:01 pm. Both comments and pings are currently closed.